We all look forward to the onset of warm weather after a long winter. What we don’t look forward to is the nagging mosquitos who threaten to ruin our outdoor fun. Those of us who live in Columbia SC have the pleasure of enjoying many months of beautiful, hot weather that extends beyond the official start of fall. Unfortunately, this also means that our mosquito season is longer. Mosquito pest control is at the top of all our minds the second we see that first itchy bite appears on our skin. Keep reading to learn how to get rid of mosquitoes in and around your home so that you and your family can enjoy the outdoors all summer long. When it comes to mosquito pest control, the first thing you need to understand is where and how these pests like to breed and congregate. By identifying and reducing the number of places around your home that they can grow and thrive, you will significantly reduce the number of them lingering around your home and yard. Mosquitos require only a small amount of standing water to breed. Therefore, reducing or eliminating areas of standing water is your first step in controlling the population. Dog bowls, bird baths, baby pools-these are all highly attractive to mosquitos. These bugs need only about 10 days to lay their eggs and have them mature into adult insects. In order to prevent the eggs from having the ability to fully mature, you should plan to tip over and dump out containers of standing water often and refilling them with fresh water if needed. Additionally, be wary of over-watering your lawn as a perpetually damp, soggy lawn will attract these unsavory pests. Keep your gutters clean and plants and bushes trimmed back and well-groomed. You can also help to prevent these pests from entering your home by making sure that your screens and windows are sealed and replaced if needed and by adding screen doors to any outside doors to act as a barrier to entry. Keeping a keen eye on the state of your yard and trimmings will help you to identify and eliminate areas that can attract pests to your home. 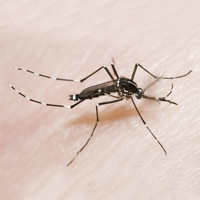 While there is a lot that can be done to help dissuade pests from breeding in your yard, you’re still likely to experience mosquitoes to some degree around your home. The best way to combat these pests is with specially designed chemical treatments that are engineered to kill both larvae and adult bugs. Cayce Bugs is the best mosquito pest control professionals to come in and give your lawn and perimeter of your home for a professional spray down. As pest control specialists, we know where these summertime bugs hang out, giving us the upper hand when it comes to eliminating them. Our specially designed sprayers allow us to achieve precise application of the repellent.